DUBLIN (CNS) — An Irish bishop urged his colleagues to establish a commission to discuss the possibility of ordaining married men. 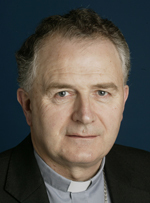 Bishop Leo O’Reilly of Kilmore also wants the Irish bishops’ conference to empower the commission to further study female deacons. The proposal stemmed from a 10-month listening process that Bishop O’Reilly led in the Kilmore Diocese, which led to a diocesan assembly and a new diocesan pastoral plan to tackle challenges facing the Catholic Church, including the declining number of priests. Some historians say women deacons existed as a special category in the early history of the church. However, a 2002 study by the International Theological Commission concluded that the role of female deacons in the early church cannot be considered equivalent to that of ordained male deacons. It also concluded that the permanent diaconate belongs to the sacrament of orders, which the church believes is limited to men alone. The article misrepresents what the ITC wrote: 1) ancient deaconesses not the same as ancient deacons; 2) there is a clear distinction between the deacon and the priest; 3) this is something for the church to decide. The ITC does not editorialize (as does Michael Kelly in CNS) that “It also concluded that the permanent diaconate belongs to the sacrament of orders, which the church believes is limited to men alone.” Priesthood is restricted to men. History demonstrates many women have been ordained as deacons. Ireland clerics underestimated how the youth vote would go in reference to Gay Marriage proposal and now they may advocate married priests and women deacons? What has happened to that country? Not sure we need to consider anything coming out of Ireland these days.